As I noted last week, I was in San Francisco on a business trip. I brought a few cameras with me, including my Wanderlust Travelwide. The weather in San Francisco was not wonderful while I was there. It was 55 degrees and foggy most of the time. Thursday afternoon there were a couple of hours where the temperature got up to 63 and you could see blue sky, but I was working during those hours and couldn’t photograph anything at that time. I had arrived in the city on July 4th. There were fireworks on the bay right outside my hotel, but since it was foggy, any fireworks that went above a certain height were attenuated by the fog. I shot some color film, but I wasn’t happy with how any of that turned out. Black and white seemed much more suited for the city of fog. I shot this at Fort Point in the Presidio National Monument, right at the foot of the Golden Gate Bridge on Saturday morning as I was heading to the airport to come home. It was so foggy you couldn’t see the bridge, which was what I was hoping to shoot. I’m pretty happy with this shot anyway. 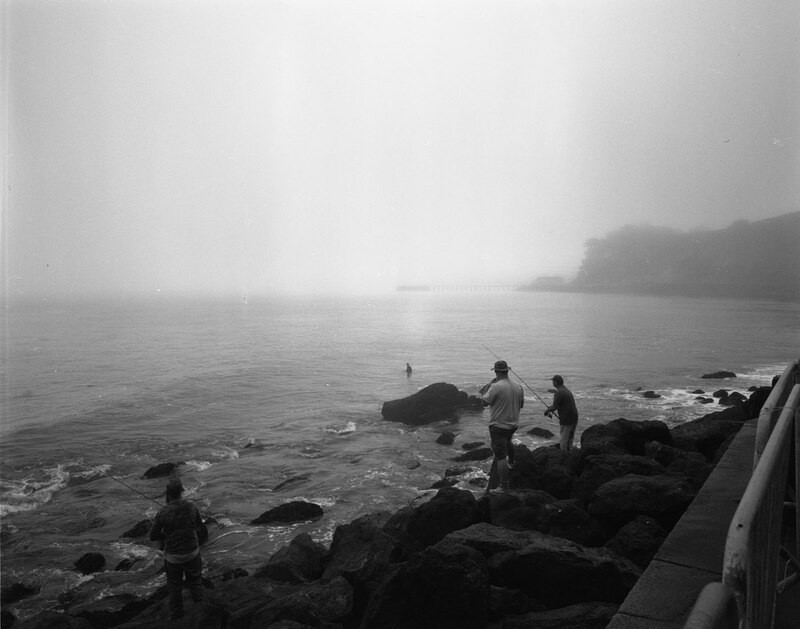 This was shot on Tri-X TXP-320, expired in 2008, with the usual Angulon lens, and developed in Rodinal 1:50 for 14 minutes.